All apologies for the absence of posts ~ in the past two weeks we’ve packed up our studio and moved from London back to San Antonio, whereupon I immediately skipped over to Albuquerque to attend the wedding of one of my dearest high school friends, leaving P behind to clean and tidy. Suffice it to say, outfits and photos haven’t been all too much of a priority for either of us, at least until now, but a wedding is obviously something special and naturally should be treated as such. The outfits in this post are actually out of order, as I wore this one to the Day-After-The-Wedding Brunch, but I was able to get more pictures of it so it goes first. I threw this on in the fifteen minutes between waking up and leaving my parents’ house to have a pre-brunch coffee with one of the bridesmaids ~ a timeline that included feeding my mother’s dogs (that’s Monty gazing adoringly at me) and cleaning up one of their overnight accidents. It’s the kind of outfit that I felt very glad to have pieces in place that I could just grab and go (two of which I acquired the day before the wedding after being stood up by said bridesmaid ~ thanks Amy!). Which two, you ask? Why, the shoes above and the shirt below, of course! (The key pieces, naturally.) I cannot adequately communicate to you the limitations of shopping in Albuquerque, so I was more than a little nervous when I set out to find a top to go with one of the skirts I brought to potentially wear to the wedding. I did find a top (though I ended up going with a different outfit) but I also found quite a bit more, largely due to the spectacular sale going on at Ann Taylor Loft (40% off regular priced merchandise and 50% off sale items ~ INSANE). To be honest I haven’t been inside an Ann Taylor in over ten years, and this was my first trip to Loft, but I ended up taking about a million things into the dressing room and having to rationally talk myself down on the number of things to purchase. I’ve had my eye out for a summery wedge to help ease me back into the world of heels, and these shoes fit the bill perfectly (in more ways than one). They’re also a shoe that would never have made it out of the box if P had been there (partly because he doesn’t like gladiator-styles and mostly because he hates gold) but his absence allowed me to indulge myself, which paid off in compliments from my friends at brunch. 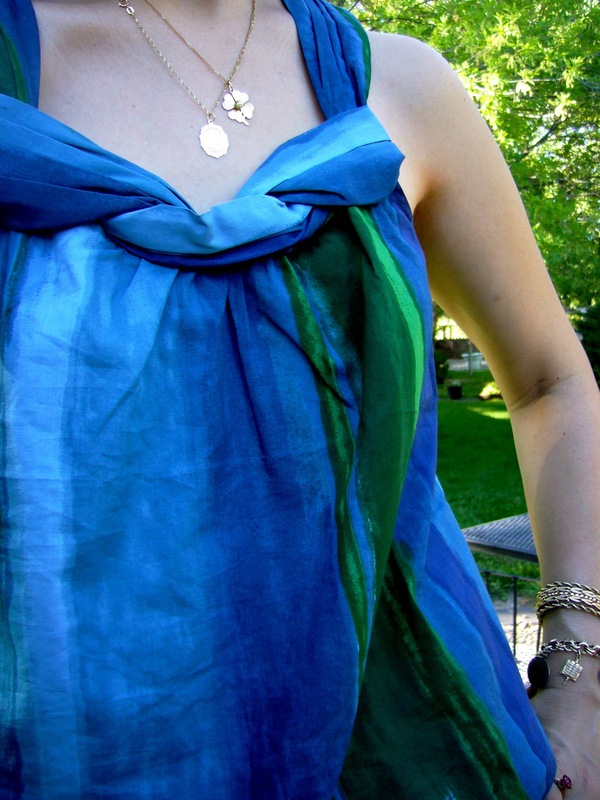 Between the beautiful print and folded neckline this top was a no-brainer. The material is cotton and silk, and while I normally avoid the latter during summer for reasons of being a sweaty mess, the mix here is lightweight, slightly slinky and very breathable, plus the elasticized bubble hem keeps it breezy and comfortable for the high desert. I’m a little less optimistic about wearing it in Texas’ super-humid heat, but we’ll see ~ I may have found my new summer fabric. Now the accessories (please forgive my self-indulgent tableau ~ I have a lot of time on my hands here). 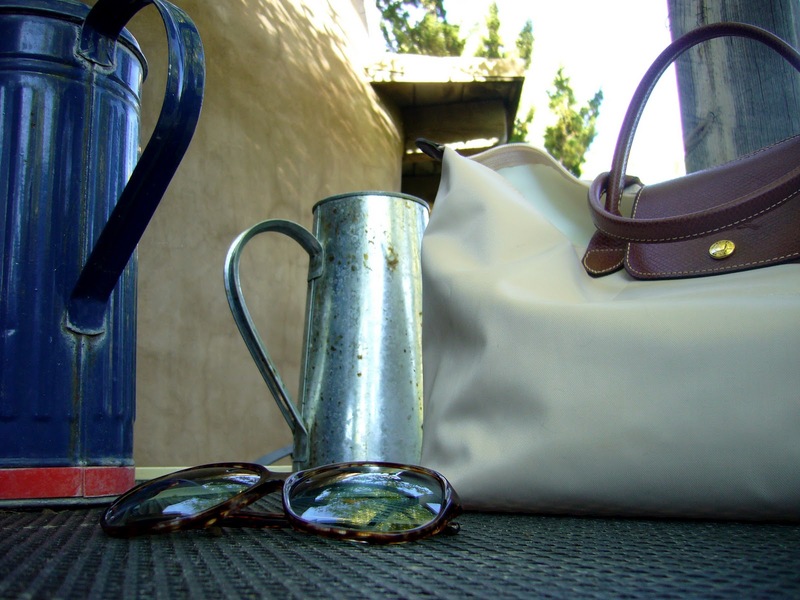 The sunglasses I wear pretty much all the time, and the bag I grabbed on sale in Heathrow because I had two suitcases as carry-ons for the flight home and wanted something to stash my book and lip balm in at my seat. I’m liking it far more than I planned to, which doesn’t bode well for future purchases. 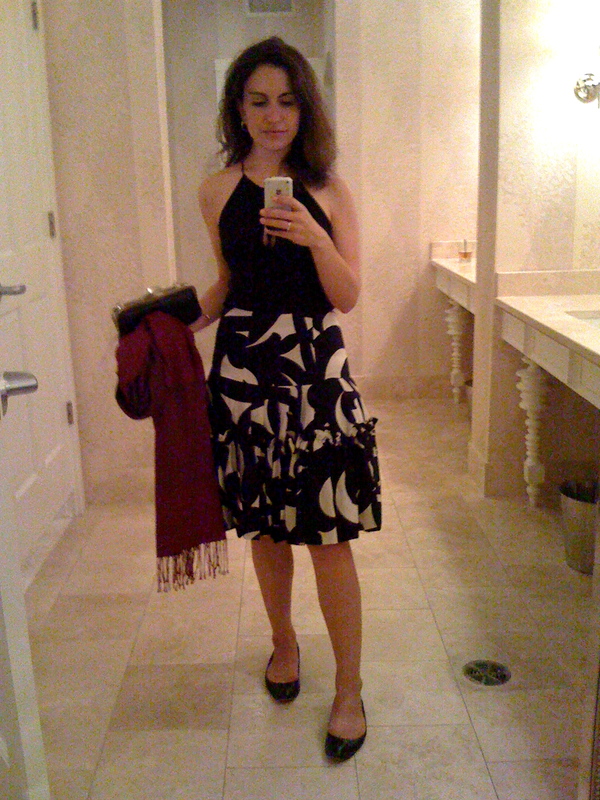 Finally, a quick snap of what I wore to the wedding, taken in the bathroom at the reception. Not ideal, I know, but I was kind of in a rush on the way out. I had no idea ahead of time what I would end up wearing so I brought five pairs of shoes, two skirts, two dresses and a couple tops, then went out shopping for more when I landed, but this was actually the outfit I had in mind all along and I’m really glad I went with it. Pretty and comfortable and great for a few hours of intense dancing with some of my favorite friends. The wedding was amazing, the bride was beautiful (the norm for her) and so much palpable love you couldn’t cut it with a knife. Also the requisite wedding-party hook-up to make us all proud. I’m not usually a wedding person, but this was far and away the best I’ve ever been to. And I am so excited for the lovely couple (who should be off to Cancun any minute now). 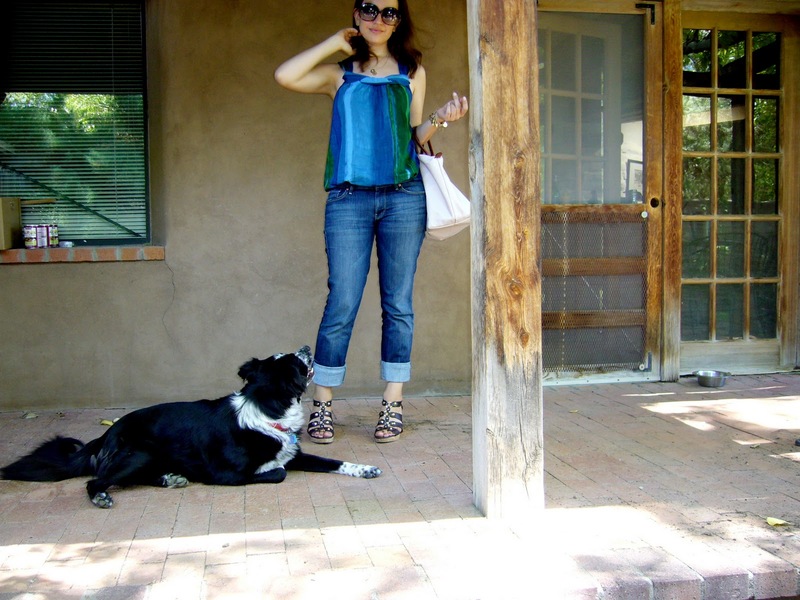 This entry was posted in Albuquerque, Hers, Outfits and tagged 7 for all mankind, ann taylor, diane von furstenberg, frank gehry for tiffany, hobo international, james avery, loft, longchamp, marc by marc jacobs, pianegonda, tahari. Bookmark the permalink. The top was a great find -who knew Ann Taylor Loft had such lovely stuff?